I can step in to support your organization’s work when you need it. I’ve worked in nearly every aspect of nonprofit administration and management and can adapt my work style to meet the project at hand. A skilled writer, I’ve written everything from short session descriptions through blog posts and brief summaries of technical information to longer white papers and substantive data reports. My writing is clean, accessible, and low on jargon. What I enjoy most about writing is synthesizing complex topics and diverse viewpoints to create educational, informative, and interesting pieces that engage audiences. I can help you with internal training pieces, external communications, and, for nonprofits, direct mail appeals and prospect research. 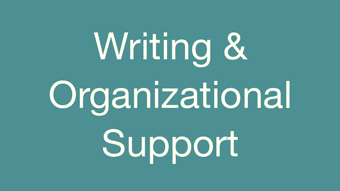 I’m also available to provide long- or short-term support to assist your organization where needed. Examples of great times to bring me in are when you have a deadline approaching, a transition in your organization, or staff out on leave. I enjoy wearing different hats for different projects and am as comfortable with being one part of a team and completing a discrete portion of the work as I am with managing all aspects of a project – crafting and ensuring compliance to timelines, coordinating other consultants or managing staff. For writing samples or to discuss my skills and availability, please reach out to me for a free consultation.